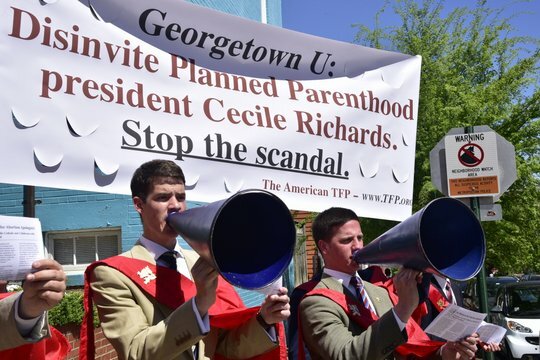 Despite the protest of thousands of Catholics, Georgetown University welcomed Cecile Richards, president of Planned Parenthood, to speak on campus on April 20. Her pro-abortion lecture in Lohrfink Auditorium, attended by some four hundred students, was nothing but a pep rally for the Culture of Death and a cutting blow against the right to life and Catholic teaching. In fact, Richards' remarks at the oldest Catholic university in America received a standing ovation. In response to this scandal, pro-life activist groups such as Priests for Life and Students for Life gathered in protest. Former Planned Parenthood employee turned pro-lifer Abby Johnson also spoke to a group organized by an on-campus association, Vita Saxa. Among these pro-life demonstrators were more than twenty young volunteers of TFP Student Action and a group of high school students from Saint Louis de Montfort Academy. "Catholic teaching, YES! Abortion, NO!" "The sin of abortion, NEVER! The Ten Commandments, FOREVER!" From the very start of the prayerful campaign at the O Street gate, it was clear that the ambience was markedly different from two weeks prior, when the TFP went to Georgetown to defend the unborn and call for the lecture's cancelation. Police lined the streets and a patrol car blocked the main gate of the university. Many of the police officers, however, were sympathetic as they had been before and one of them joined in for a few lines of “God Bless America” as it was played on the bagpipes. With fliers, banners and rosaries, TFP Student Action members began the campaign. Reactions were immediate. Across the street from where the main group of TFP volunteers was set up, a student on the third floor of a building played loud, crude music in an attempt to drown out the recitation of the holy rosary. It was to no avail. The combined voices of the TFP group were able to overpower the noise. Counter demonstrators from Planned Parenthood occupied a corner adjacent to the main banner, holding signs and shouting slogans of their own. Others, in pink dresses, made vulgar comments to volunteers handing out pro-life fliers. The three Planned Parenthood supporters soon dispersed and more pro-lifers arrived. One female student – who had previously told the TFP to go to blazes (in less civil terms) and even tried to get the police to remove the group from public property – accepted a flier. In protest, she held it up before several cameramen and tried, unsuccessfully, to light it on fire. After only being able to singe the corner, she threw it on the ground. At a certain point, a group of seven students approached TFP Student Action director John Ritchie to debate. Being insufficiently prepared, many of them broke away, preferring to congregate on the outskirts of the campaign where they snickered at the recitation of the rosary. “I’m getting sick of being around all these white men,” a pro-abortion female student said, in spite of the fact that there were TFP volunteers from Mexico and the Philippines just several feet away. Beyond those threadbare "my body" clichés, the opposition did not have much to say. When it comes to what is right or wrong, these students confuse being politically correct with being actually correct. Their moral compass is haywire. On the way out of campus, the TFP volunteers met Fr. Stephen Imbarrato of Priests for Life, who after taking a photograph with the young men explained to them how Georgetown University (a Catholic University) told him that he (a Catholic priest) would not be welcome there if he was going to openly defend Catholic teaching on abortion and contraception. “Outstanding! Thank you TFP Student Action for standing for truth and for supporting pro-life students at Georgetown. As a Georgetown alumnus I am thoroughly outraged at how my alma mater flaunts its status as the oldest Catholic University in the country in marketing materials but fails to follow through on its Catholic mission." Georgetown should be promoting the right to life, not undermining the truth by allowing Cecile Richards to poison the minds of so many students with the lies of Planned Parenthood. True Catholic shepherds always defend the flock by warding off the pro-abortion wolves, even when the wolves are disguised as sheep. In this case, however, Georgetown welcomed a prominent pro-abortion wolf who dresses, talks and acts like a wolf without any disguises, a wolf whose single purpose in life is to perpetuate the Culture of Death. Whose side is Georgetown on? Watch TFP's April 4 pro-life demonstration at Georgetown here.